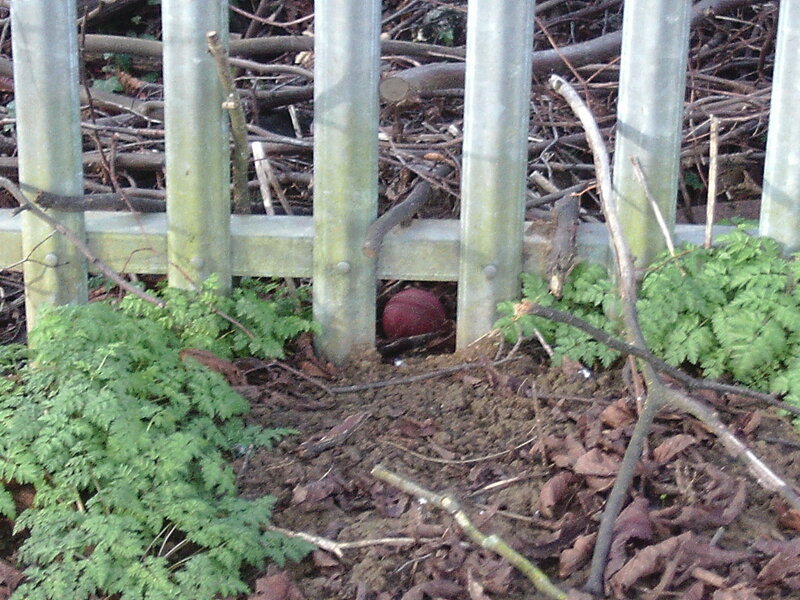 as I often do on a Sunday morning, when I noticed this cricket ball, nestled in some twigs a little beyond the railings that separate the ground from the railway line. 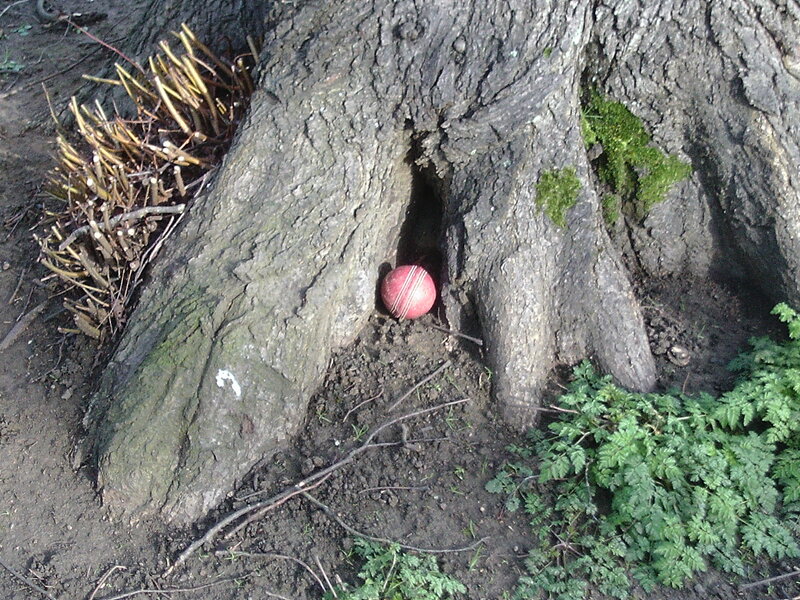 Lost balls are, of course, a feature of any Summer at a ground which is bordered by a hedge; the initial thrill of the stroke that sent it there succeeded by the sinking feeling as it disappears from sight into the thorny depths; first the tentative peering, parting and poking of the fieldsmen, then the call for a stump, then a replacement ball as some club stalwart (mindful of how much the things cost) continues to rummage, vet-like, elbow deep in the hawthorns, plucking out Cokes cans, tennis balls, a sleeping hedgehog, anything but that damn’d elusive crimson rambler. In Winter, when the foliage dies away, the hedge gives up its secrets and the lost balls, in various stages of decomposition, reveal themselves. As this one was (in management-speak) such low hanging fruit I couldn’t resist tickling it out, weighing it in my palm and running a finger along its still proud seam. One of last year’s balls, clearly, and if not match-worthy, then, after a little reconditioning, still useable for net bowling, and I couldn’t quite decide what to do with it. Taking it home would be stealing, but the pavilion was shut and I don’t suppose it would have fitted through the letter box. If I left it on the ground some child might have picked it up, enquired of a doting grand-parent what it was for and been treated to a few arthritic leg-breaks, thus sparking a life-long interest in the game. On the other hand the child might have picked the ball up and hurled it at their tiny playmate’s head, the grandparent might have (McGrath-style) turned their ankle, or a foolish dog might have broken their teeth on it. In the end I left it, half concealed, at the foot of a tree. Perhaps the groundsman will come across it as he makes a pre-season sweep of his domain, pocket it, and after a quick polish, reunite it with its fellows in the ball box. Or perhaps some passing poet will espy it and find it has provoked some thoughts that lie too deep for tears. I hope so, because I’ve tried quite hard and – do you know – I can’t think of a damn’d thing. Sorry about that. Stumbling on this post, in the wintry internet cyber-scape, brings pleasures similar to finding a cricket ball under a hedge, lost since summer. Thanks, Chris. Always delighted when someone enjoys this kind of thing. 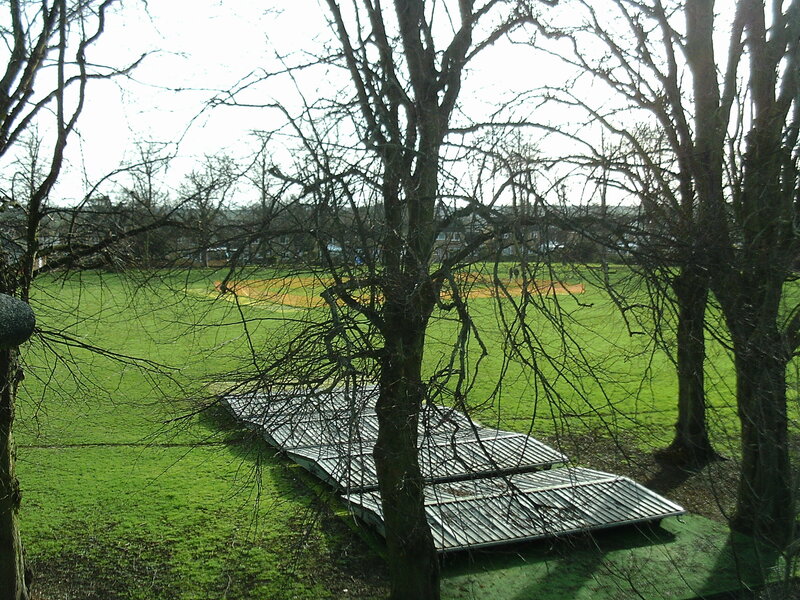 The cricketing cyber-scape does strike me as a bit wintry at the moment.